I love Christmas music, but I am picky about it. The local light rock, Clear Channel-owned radio station became "The Holiday Station" back before Thanksgiving, but this year, it has a serious case of the doldrums. I think they have the same 20 songs on shuffle, and I'm sick of it. Computer-related issues have left me temporarily (I hope!) without my mp3 collection, and many of my CDs are in storage. That leaves me with Spotify, Pandora, and my vinyl records. But I bought a new CD this year! Even though this beauty is available for streaming on Spotify, I love owning each Elizabeth Mitchell & You Are My Flower album. Her music was some of the first my baby Big Sis fell in love with, and I cherish each new release. Now there is a Christmas album! 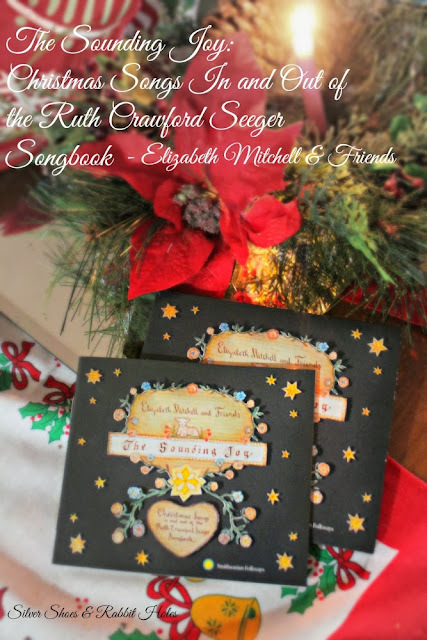 The Sounding Joy is subtitled "Christmas Songs In and Out of the Ruth Crawford Seeger Songbook," as the songs on the CD are mostly old American Christmas and winter songs collected by Ruth Crawford Seeger, mother to Mike, Peggy, Barbara, and Penny Seeger, and stepmother to Pete. The songs are mostly religious in nature, as they pre-date Santa and our modern American Christmas, but you don't have to be religious to enjoy them as the beautiful folk songs they are. 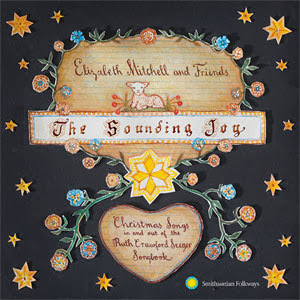 Crawford Seeger Songbook - Elizabeth Mitchell & Friends. This is a peaceful album, a beautiful respite from the more raucous bustle of the season. This is a relax-on-the-couch-while-looking-at-the-lit-tree-with-the-kids kind of album. A knitting-late-at-night-with-a-hot-cup-of-tea kind of album. A soothe-your-little-one-to-sleep kind of album. 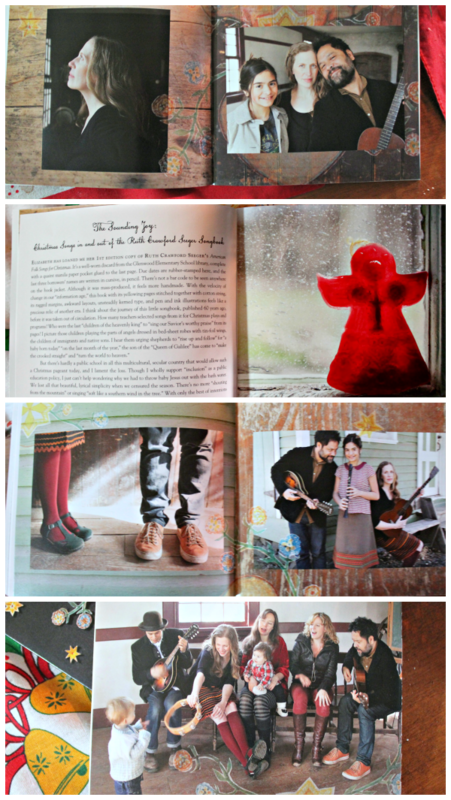 You can download The Sounding Joy here and here, or you can buy the CD here and here. (If you download from the Smithsonian-Folkways site, they even provide a link to download the liner notes.) It is also available via iTunes, eMusic, and Amazon. Ruth Crawford Seeger's daughters recorded a similar album, which is also available from Smithsonian-Folkways. The book American Folk Songs for Christmas by Ruth Crawford Seeger has also been reissued. Check out the Barbara Cooney cover art! For the record, a lovely woman contacted me with the offer of a free zip file of the album, in exchange for a review. I told her the truth: I have no place to store music files right now, and I was planning on buying a CD for myself anyway. I had already listened to the album more than once on Spotify, and I'd already planned on telling everyone how lovely it is! this looks so great! I love the cover art! since we gave up cable, I've been a bit disappointed with the offerings from Pandora -- I really loved whatever the cable music holiday channel was when we had it -- it was very peppy and had songs like Here Comes Susie Snowflake (dressed in a snow white gown) have you ever heard that one? So cute! A friend just sent me a holiday mix CD and I'm so excited to listen. She did it in lieu of xmas cards, isn't that clever? Do you like Johnny Mathis? To me, he is the king of Christmas music! oh this sounds lovely. Thanks, I'm definitely looking into getting one of these. Its time to add to our Christmas music repetoire. It's so very lovely, and different from everything else that's out there right now. We've been enjoying it! I just noticed Natalie Merchant - I used to be such a fan! (back in the day when REM's green was in everyones sony walkman). I will need to find out about them! I love Christmas songs and I have so few CDs!